Bollywood Events Melbourne will be hosting the Bollywood Diwali Cruise Night 2017 in Melbourne on Saturday the November 4th, 2017- Come fall in love with our Bollywood Diwali Cruise Night to Celebrate India’s Festival of Light (Diwali). Note that 2016 was a Sold Out Cruise and book your ticket before it’s sold out this year too. Best cruise in Melbourne for the second time – Resident DJ BABA will be on live brings you the best of Bollywood Top charts. Package includes welcome drink, both options of veg & non veg – entree/main course/sweets. Thanks to New Home Shop who are our Platinum Sponsors and to Ash Financial Services who are the major sponsor along with Promotion Partners Indus Age & RaabtaTeam Adelaide. Live DJ, Dance, Food and Much More. 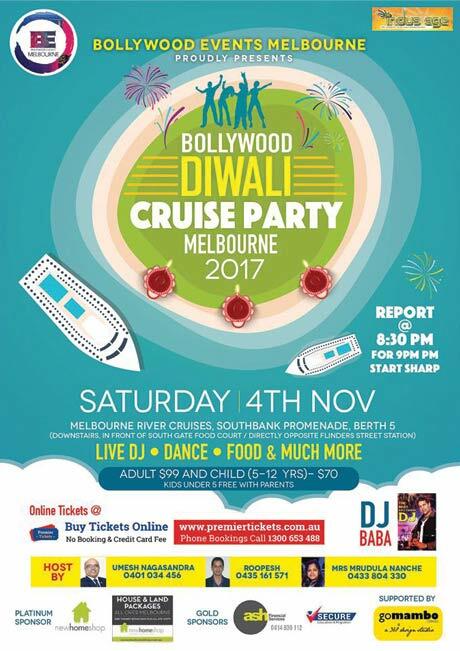 Premier Tickets Australia is proud to be the online ticketing partner for Bollywood Diwali Cruise Party 2017 Melbourne.